Mobile Flush – Veracity Group Inc.
Make Mobile Flush™ part of your Infection Control / Emergency Preparedness Program. Mobile Flush is the safe and sanitary way to flush toilets and clean bedpans during a scheduled or un-scheduled water shut down. During a planned ( hospital construction, water supply maintenance) or unplanned water outage, a hospital is responsible for disposal of human waste in patient room toilets, bedpans and bedside commodes as well as public access toilets. The current CDC suggestion of using a bucket of water from a 55 gallon drum to flush the toilet has some significant drawbacks. The use of a bucket makes it almost impossible to wash out bedpans, leading to disposal of the bedpan and contents into a bio-hazard bag, special bio-hazard handling and disposal, and all the associated costs. Potential employee injury from lifting heavy buckets of water and also the risk of a fall due to splashing water on the floor. With the use of Mobile flush, you satisfy the OSHA requirement for hospitals to use Engineering Control Methods to protect their employees from exposure to blood & other body fluids. 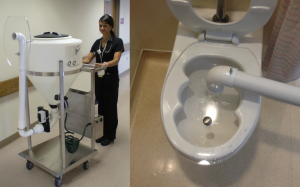 Any employee can very safely, quickly and efficiently flush toilets in a patient room or public facility, rinse out bedpans and do it in a way that protects employees/patients/and the public from any kind of direct contact or exposure through aerosolization of liquid or solid waste. Mobile Flush not only provides a better methodology, but will increase patient satisfaction during these situations as well as decrease potential exposure and injury to employees, patients and the general public and reduce the amount of bio-hazard waste.